Although they might not suit your palate, cruciferous vegetables are one of the best things you can include in your diet. Ah, the dreaded pile of broccoli. There it sits on your plate, daring you to eat it. As you ponder stabbing your fork into the smallest floret, you can still hear your mother: "I don't care how they taste. Eat them because they're good for you!" Well, Mom was right. Introducing The Cruciferous Family, whose members include broccoli, cauliflower, brussel sprouts, turnips and kale. All are loaded with phytochemicals, vitamins, minerals, and fiber - all of which help prevent chronic illnesses including type 2 diabetes, cardiovascular disease and even cancer! Skeptical veggies could harbor such power? Researchers at the Fred Hutchison Cancer Research Center discovered that men 40 to 64 who ate 3 or more ½-cup servings of cruciferous vegetables per week were 41% less likely to develop prostate cancer. Furthermore, cruciferous veggies are full of antioxidants (beta-carotene and sulforaphane), fiber, vitamins and minerals. They also contain isothiocyanate -- which stimulates the body to break down cancer-causing carcinogens - and indole-3-carbidol (I3C), which may prevent breast, ovarian and prostate cancers. Because of their high antioxidant content, cruciferous veggies may help protect against cancer by reducing oxidative stress. Oxidative stress refers to the overload of harmful free-radicals in the body. In a study funded by the National Cancer Institute, it was found that oxidative stress in the subjects' bodies dropped 22% during the period when they were eating 1-to-2 cups of cruciferous vegetables a day. It should be noted that frequent consumption of insufficiently cooked cruciferous vegetables can lead to goiter (enlargement of the thyroid gland). Raw cruciferous vegetables contain goitrogens, which interfere with thyroid hormone formation. This results in an over-secretion of thyroid-stimulating hormone (TSH) due to low thyroid hormone levels and an enlarged thyroid gland. Always cook your cruciferous vegetables, but take care not to overcook them. Why? Cruciferous vegetables contain phytochemicals called glucosinolates. Once consumed, glucosinolates are converted into isothiocyanates and indoles, which possess anti-cancer, antioxidant and anti-inflammatory effects. The heat from overcooking will destroy the enzyme myrosinase, so overcooking your cruciferous vegetables will reduce their disease-fighting potential. Bottom line: Do not overcook your cruciferous crunchies. Lightly steaming them will suffice. Another reason not to overcook cruciferous vegetables is, well, the smell! Overcooking cruciferous veggies can produce a strong, unappealing sulfurous odor. Instead of cooking your cruciferous to a crisp, the trick is to create recipes that suit your taste-buds. Include veggies in your soups and salads, as side dishes, or use them in a morning omelet! Meeting the family is like seeing the forest; now it's time to look at the trees. This cruciferous veg contains more calcium than a glass of milk. Not only does 1 cup of broccoli provide you with the recommended dietary allowance of immune-supportive vitamin C, it also contains high levels of folic acid, calcium, vitamin K and B6, potassium, lutein and vitamin A (beta-carotene). Calcium and vitamin K are important for bone health and the prevention of osteoporosis. The carotenoid lutein helps prevent macular degeneration, cataracts, and may also reduce the risk of atherosclerosis, heart attack and stroke. Broccoli is also high in fiber, which prevents constipation, helps maintain low blood sugar levels and curbs overeating. Broccoli is also rich in a flavonoid called kaempferol, which provides the body with anti-inflammatory benefits. Broccoli contains glucoraphanin, which the body processes into an anti-cancer compound called sulforaphane. Sulforaphane rids the body of a bacterium called H. pylori that is known to increase the risk of stomach cancer. Lastly, broccoli contains indole-3-carbinol, which is an antioxidant and an anti-carcinogen that might hinder the growth of breast, cervical and prostate cancers. According to a study by researchers at the UCLA Medical Center in California, men and women aged 50 to 74 years who ate broccoli regularly were 50% less likely to develop colorectal cancer than those who did not eat any broccoli. 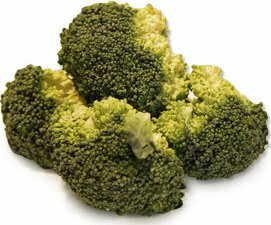 In order to reap the cholesterol-lowering effects of broccoli, remember to cook it by steaming. Be sure to include broccoli in your diet on a regular basis (at least 2-3 times per week)! Did you know that Brussels sprouts contain nearly 50% more vitamin C than an orange? 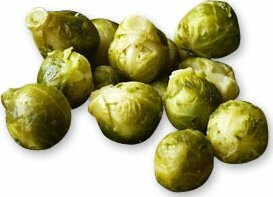 Not only do Brussels sprouts provide an excellent source of vitamin C, they also contain folate, fiber, vitamins A and K, indoles and lutein. Folate helps prevent neural tube defects in unborn children, indoles are known for their cancer fighting properties and lutein aids eyesight. Jean-Claude Van Damme will always be the "Muscles from Brussels," but these little sprouts still pack a strong punch! Kale is known for its antioxidant, anti-inflammatory and anti-cancer properties. 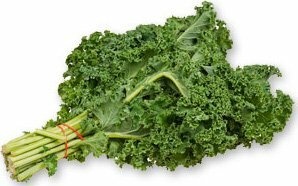 It is a leafy green vegetable loaded with vitamins A (beta-carotene), C, E and K, calcium, and the phytochemicals lutein and zeaxanthin, which help protect the eye (retina and lens) from oxidative damage. In fact, studies are linking higher lutein intakes with a lower risk of cataract formation and macular degeneration. Cauliflower is a good source of fiber, vitamin C and folate. In addition to its cancer-fighting phytochemicals, it also supplies vitamin A, calcium, selenium and potassium. Bok Choy is a great source of vitamins A, C and K, calcium and folate. 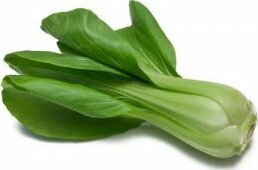 Eating bok choy raw will preserve its cancer-fighting compounds; cooking it will improve the absorption of its carotenoids. Maximize bok choy's health benefits by eating it raw some days and lightly cooking it on other days. Cabbage is loaded with vitamins A, C and K, plus glutamine, which is an amino acid with anti-inflammatory properties. 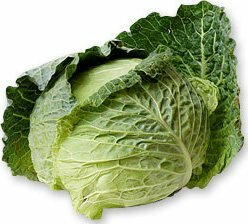 In medieval times, cabbage was referred to as the "drug of the poor." Cabbage is known for its anti-cancer properties and studies have suggested that people who eat large amounts of cabbage have low rates of colon cancer. Now that you've met the family, start eating them regularly! Yes, this sounds terrifying, but the health benefits should outweigh any discomfort from eating "Brother Broccoli." Since variety is the spice of life, be sure to incorporate myriad cruciferous veggies into your diet. Other options include rutabaga, turnips, arugula, horseradish, radish, mustard greens and watercress.